ARRA SAN AGUSTIN is one of the most promising new actresses today at the Kapuso network. Born on April 25, 1996, she’s a runner up in Starstruck 7 in 2015. A psychology major at La Salle, she’s also into ballet and figure skating. She was initially given supporting roles in various drama shows then was made to join the cast of “Bubble Gang” where she learned to do comedy. She was later cast in “Encantadia” as Ariana. In “The Cure”, she was paired with Ken Chan and they played husband and wife. 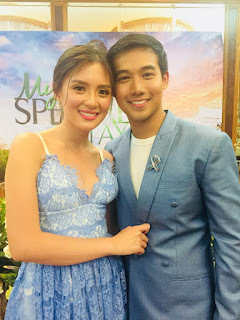 Their love team gained a lot of fans so it’s not surprising that they are now paired anew in the new soap, “My Special Tatay”, that starts airing this afternoon to replace “Hindi Ko Kayang Iwan Ka”.